Common Market for Eastern and Southern Africa (COMESA), the East African Community (EAC) and the Southern African Development community (SADC) met and signed a declaration launching negotiations for the establishment of the Tripartite Free Trade Area (TFTA). Egypt signs Tripartite Free Trade Area Agreement: A Good Idea on Paper? Representatives from nearly half of Africa’s countries signed, on June 10, an agreement creating the Tripartite Free Trade Area (TFTA), capping nearly five years of negotiations. The trade deal would allow improved movement of goods, capital, and people among the 26 countries party to the agreement. 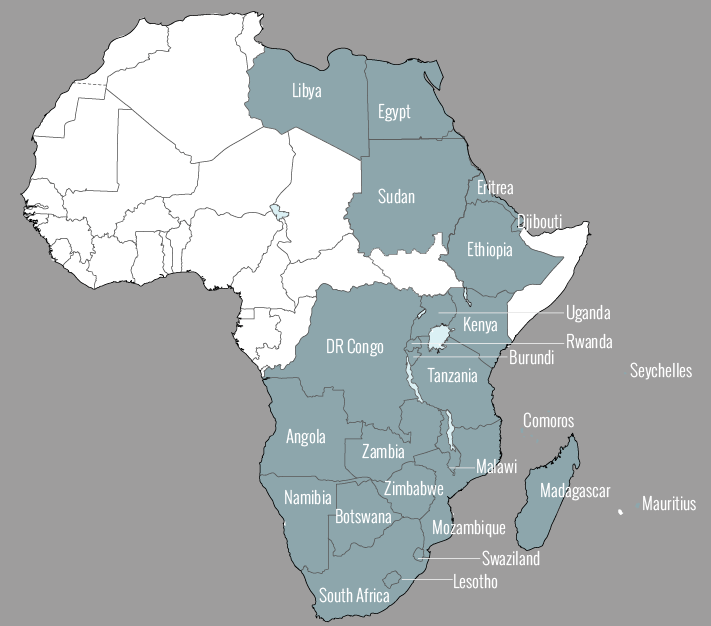 By integrating the members of three main African trade zones—the East African Community (EAC), the Southern African Development Community (SADC), and the Common Market for Eastern and Southern Africa (COMESA)—the TFTA hopes to strengthen economic relations within the new bloc. The TFTA also aims to attract investors with the prospect of an internal market of a combined GDP of over $1 trillion and 625 million people—making the TFTA larger, in population, than the EU or NAFTA. Negotiations, which started in 2011, were buoyed by the fact that some of the largest economies are the ones that stand to gain the most. Economic simulations put South Africa, Mozambique, Egypt, and Kenya as the countries that could benefit the most from an FTA. For some countries, geopolitical ambitions in the region are probably as much an incentive for the deal as the economic benefits. Keen on deploying an image of leadership, Egypt has long since relinquished this title in the Arab region to its Gulf financiers. Turning its attention to the African continent was the obvious next choice. Tensions across the Nile basin, primarily with Ethiopia over its Grand Ethiopian Renaissance Dam, had seen Egypt (and to a lesser extent, Sudan) at odds with the other nine Nile riparian countries. Egypt, however, successfully reduced tensions with Ethiopia in March, signing a “declaration of principles” agreement with Ethiopia and Sudan. The TFTA is arguably the most important development in intra-African trade of recent years, but an increase in intra-African trade will require more than a ceremonial agreement. After all, there is a reason why, despite no fewer than 14 regional trade agreements, only 12% of the continent’s trade is within itself (compared to nearly 70% in Europe and 55% in Asia). The continent suffers from weak infrastructure connectivity and inefficient logistics services, which must be addressed if African companies and economic entities are to be able to take advantage of opportunities to integrate their value chain operations regionally and beyond. The signing of the agreement is just the first step in a long process. And though achieving a common accord between the three trading blocs is a laudable success, the agreement still needs to be approved and ratified by 26 national parliaments—a process that the signatories acknowledge could take up to two years. More importantly, the participating countries and organizations will need to work out a detailed timetable to bring down trade barriers between countries of the various blocs, which requires new negotiations. Until this happens and implementation begins, the TFTA will remain a mere good idea that could have been. Infrastructure remains a major binding constraint in the development of African trade, for the envisioned Cape-to-Cairo union will not be a reality without an internal open land network. Improving infrastructure—roads, railways, waterways, ports, airports—will be key if this union is to create more trade. There is currently no smooth Cape-to-Cairo connection, as railways across the region follow different standards; agreeing on and then installing a single track gauge would be difficult and very expensive. Transit corridors of major paved roads and railroads need to be developed, most likely in collaboration with the private sector. With infrastructure development must come the harmonization of trade rules: the removal of non-tariff barriers, reducing transit costs, setting rules of origin, and financing. Imposing too-tight rules of origin, which determine how much of a product must be made with local inputs to enjoy duty-free access to neighboring countries, could discourage investors seeking to take advantage of the free trade area and impose prohibitive costs of value chain integration. However, if the rules are too liberal and required local inputs are minimal, investors would only need to make minimal investments to take advantage of the FTA, thus minimizing the development purpose of the agreement. International support will be important to help the TFTA achieve its development goals. National and international aid agencies (such as Britain’s Department for International Development, Japan’s International Cooperation Agency, the United States Agency for International Development, and various bodies in the European Union) are already supporting the development of some main corridors and one-stop border crossings. The African Development Bank has created the Africa Trade Fund, which supports trade facilitation programs across the continent. The private sector must also be given a larger role, through public-private partnerships and possibly concessions to run some key infrastructure projects. The TFTA has great potential. Africa’s economic performance has outstripped the global GDP by an average of three percentage points over the past 15 years. Despite a slowdown, its 2015 GDP growth is predicted at 4%, above the global average of 2.9%, and is expected to further pick up, boosted by investment in natural resources and infrastructure, as well as strong household spending. And with half of the African continent and two of the largest three economies on board, the door is open for increased continental integration. The anticipated benefits of an enlarged union may just be sufficient to succeed where the smaller blocs failed, and convince member countries to dismantle barriers to trade between them. But the hardest is yet to come.